Cherry season was finicky in New York. You'd either hit the jackpot with plump, gorgeous fruits, or you'd be left wanting more, disappointed in the lack of variety and flavor. When the cherries were good, I wanted to do little else than eat them or make a claufoutis. 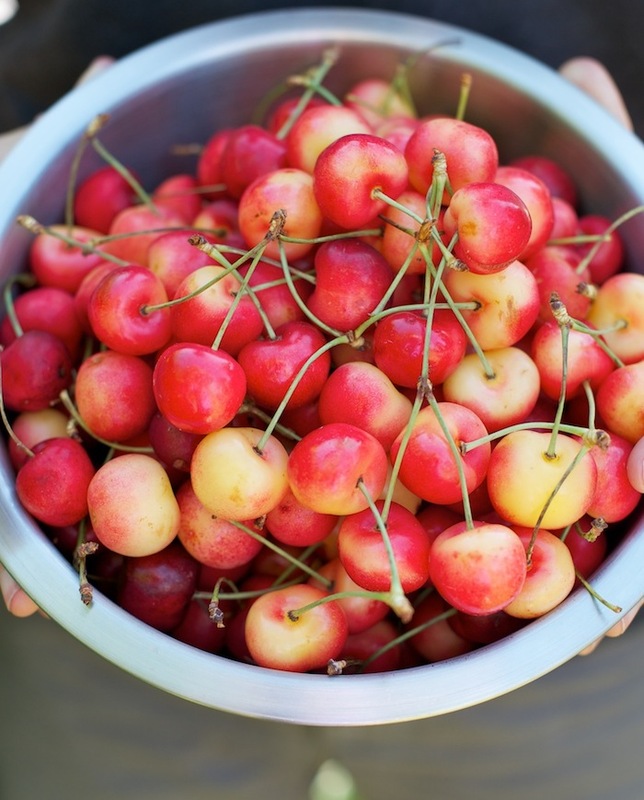 In Oregon, many farms grow cherries, their baskets heaped with Rainier and Bing varieties, among others. The consistent taste and sheer quantity allows me ample opportunity to buy enough cherries to both snack on and jam with. 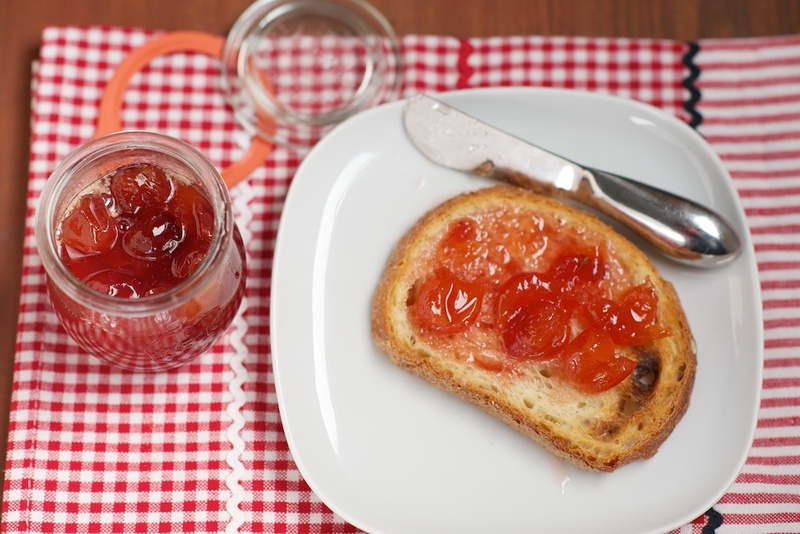 This cherry jam is a decidedly 'grown-up' jam, better eaten in the afternoon than in the morning, after your taste buds have warmed up. As I flipped through my already well-loved copy of The Blue Chair Jam Cookbook, I stopped at Rachel Saunders' recipe for Red Cherry Jam. She flavors the jam with both cherry kernels and maraschino liqueur (which results in that not-for-morning, but so-perfect-for-afternoon taste). I attempted to flavor my jam with the cherry kernels. 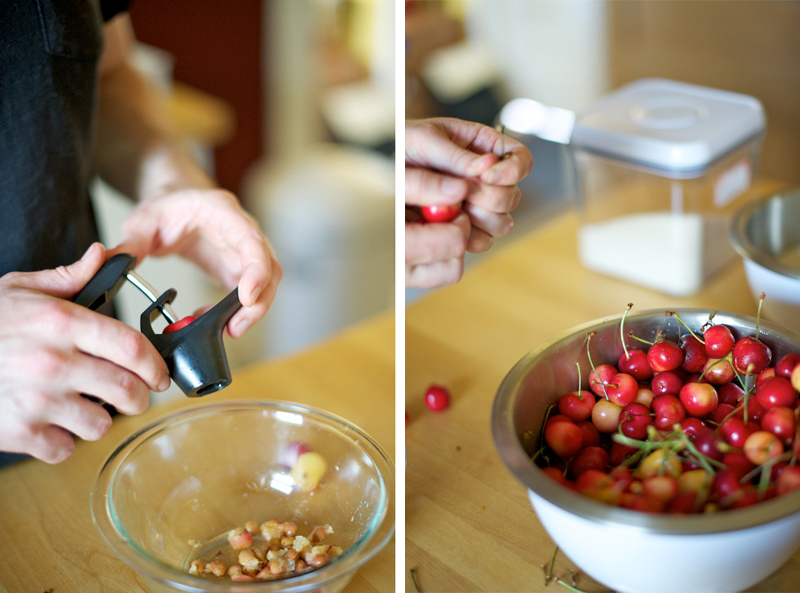 After patiently pitting four pounds of cherries, with Justin's help de-stemming, I gathered the pits, put them on the floor on top of a towel, covered them with another towel, and began hammering them. Yes, I crouched on the floor and hammered at cherry pits. If you hammer confidently enough, the pit cracks open to reveal delicate light kernels. I had planned to use these kernels as Saunders directed, as a way to subtly flavor the jam while it cooks. Unfortunately, the only tea ball I own has a long metal cord, and every time I began stirring, the cord separated from the pot and the metal tea ball started to pop open. If you do have a tea infuser with a firm latch and without a cord--and you feel like hammering cherry pits while crouched on your kitchen floor--consider keeping this step of the recipe. If you'd rather not, I can attest that my cherry jam is sweet and subtle and I didn't find myself wistfully wishing for the cherry pit flavor. *If including the cherry pit step* Place the cherry pits on the floor between two clean cloths and, using a hammer, tap them through the cloth until they crack. Carefully remove the smaller kernel from each pit, until you have 1 1/2 tablespoons worth. Chop these kernels coarsely. Place the chipped kernels into a stainless steel tea infuser with a firm latch and set aside. Place several teaspoons in your freezer. You'll use these to test the jam later. Combine 3 pounds of the cherries with 1 1/2 pounds of the sugar in a large mixing bowl. In a measuring cup, combine the lemon juice with the maraschino liqueur and set aside. 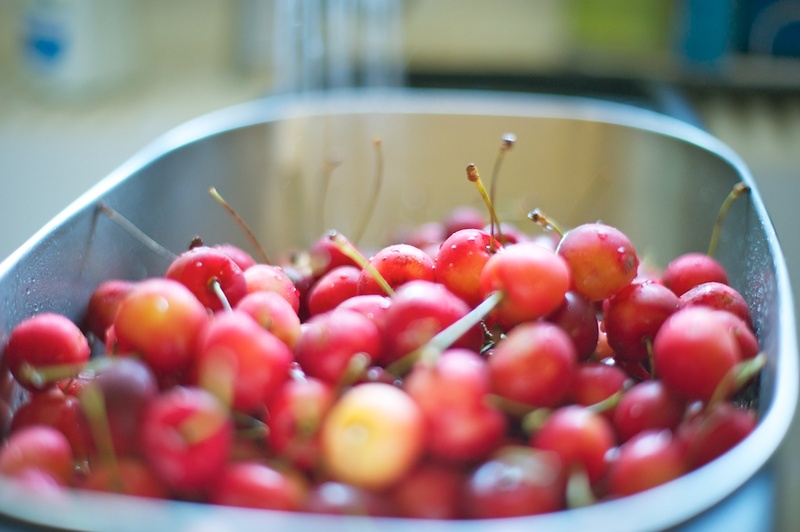 Place the remaining one pound of cherries and 7 ounces of sugar, along with 2 ounces of water, in a wide kettle. Cook over low heat, stirring constantly. Gradually increase the heat to medium, until the mixture boils. Cook for seven minutes more, until the cherries have shriveled and the liquid is syrupy. 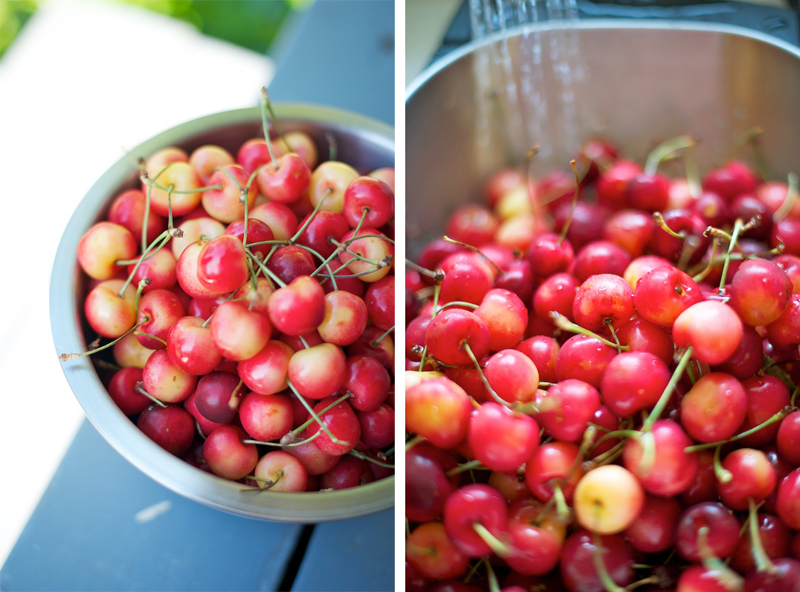 Immediately pour the hot cherries into a metal strainer over the bowl with the raw cherries and sugar. Press down on the cooked fruit to drain every bit of liquid. Discard the cooked cherries. Add half the lemon juice mixture to the uncooked cherry mixture, stir to combine, and transfer this mixture to the large kettle. *If using the cherry kernels, place the tea infuser into the mixture. Bring this mixture to a boil over medium heat, slowly increasing the heat to high. Boil rapidly for 10-15 minutes, stirring every few minutes. Between stirrings use a spoon to skim the foam carefully off the top. After 10-15 minutes, remove the pan from the heat. Do not stir. After the mixture has rested for a minute, scrape as much of the white foam off as you can and discard. Then, stir in the remaining lemon juice mixture. 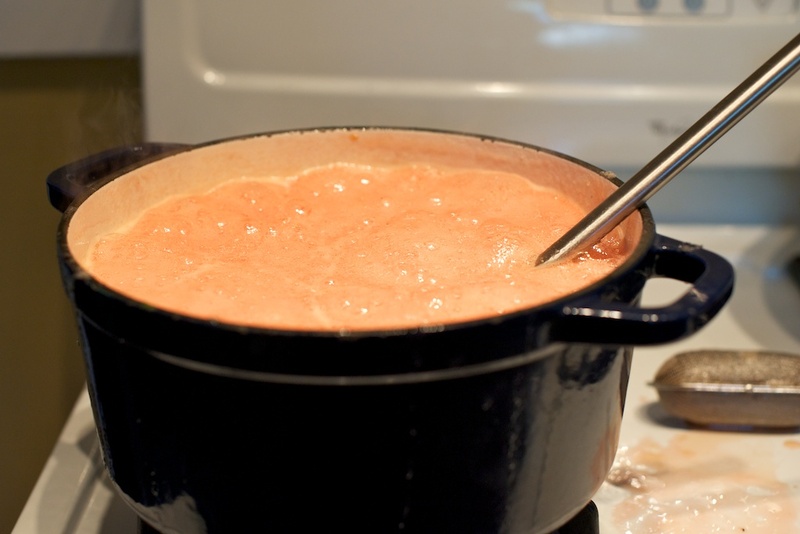 Return the jam to the stove over medium high heat and cook, stirring frequently. After 5 more minutes, your jam should be done or nearly done. To test for doneness, remove the jam from the heat. Do not stir. 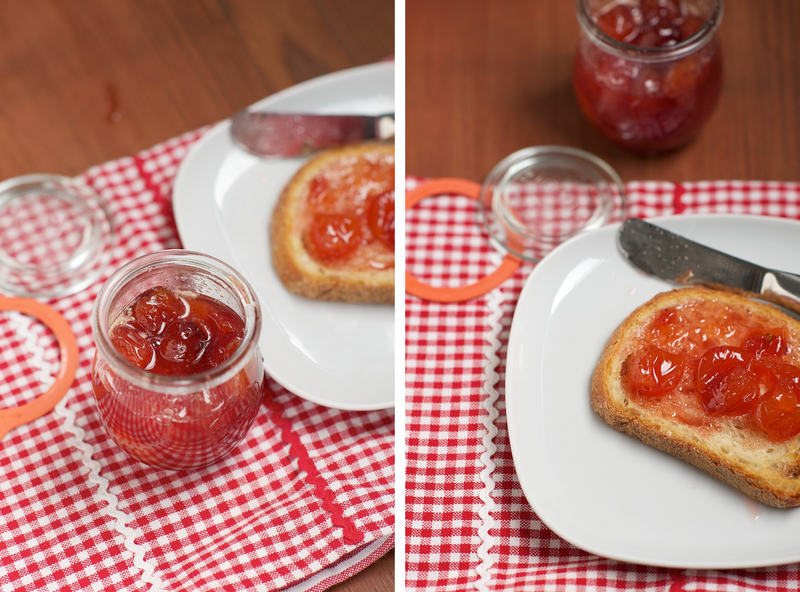 Transfer a small half spoonful of jam to one your frozen teaspoons. Put the spoon back in the freezer for 3-4 minutes. When you remove the spoon, it should feel neither hot nor cold. Tilt the spoon vertically to see how the jam runs: if it runs quickly, cook the jam for a few more minutes, and repeat the same testing procedure. If it is reluctant to run, your jam is done. Let the jam cool slightly and skim off any additional foam that has formed. After filling your jars and securing the lids (use gloves if the jars are too hot to handle) carefully put the jars back on the cookie sheet(s) for 15 minutes. Remove the jars from the oven keeping them on their sheet(s). Put the sheet on a wire rack and cool them over night. They will seal as they cool.